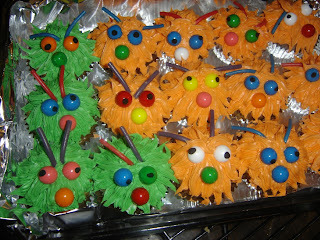 These were some of my very favorite cupcakes. They were made for Seth’s Kindergarten class when he turned six. Cupcakes have pulled out star tip “hair”. The eyes and nose are bubble gum balls, and the antennae were made of twizzler pulls.